Anyone who is interested in growing quality plants, whether they are flowers, vegetables, or anything else they might enjoy, should take a serious look at everything a hydroponic system has to offer particularly those best hydroponic systems. The elimination of soil from the growing process will allow you to save a large amount of space while simultaneously maximizing your harvest. Indoor growing offers you more options, more privacy, and the ability to control a wider array of factors that will contribute to the overall quality of your crop. You will no longer be combating free radicals of the environment and outdoor limitations you may face by embarking on a traditional grow project. Ultimately, hydroponic systems open doors to tons of new possibilities, and everyone can benefit from what they can provide for you. How to choose the best hydroponic gardening systems? What Should Be Known before Buying Your First Hydroponic System! What does Hydroponic Weed Mean? How Do you Actually Start Growing Hydroponic Weed? You will no longer be limited by the amount of space you have to grow in. The compact size of a hydroponic system will allow you to transform a small closet, a porch, a shed, or even a conveniently located table into your own pint sized garden that packs a big punch. When it comes to indoor growth, hydroponic systems are undoubtedly the best way to get the most out of your money. These will allow you to recycle your resources, such as nutrients and water, to lower the costs you will experience by having the constant need to repurchase materials. Being able to reuse as much as possible is paramount to spending less, and that’s an opportunity which traditional soil cannot provide for you. Hydroponics will be able to help you keep your garden organic. If an organic crop is your main aim, keeping your plants indoors will allow you to control what they’re exposed to. You won’t have to worry about polluted ground water or other chemicals that could make their way into your plants if you left them outdoors. You won’t need to use insecticides or similar chemicals for pest control or soil treatment. As long as there’s no way for bugs to get into your grow room, you’re safe. Bacteria and plant diseases won’t be able to reproduce in a well maintained hydroponic system. The direct delivery of targeted nutrients will produce the healthiest plant possible. Because these nutrients are delivered with maximum efficiency, you’ll even experience less waste this way. A well-nourished plant produces the best crop, so you can guarantee you’ll be proud of your harvest. Which is the best Hydroponic System? Growing plants in gravel, sand, or other non-soil material as a growing medium plus added nutrients and water, using no soil. Aeroponics is actually a type of hydroponics that uses the nutrients and water only, with no growing medium. Aeroponics uses no soil, gravel, sand, foam or other material. The roots are misted with nutrients. Since Aeroponics is a form of hydroponics, what we really want to look at is not Aeroponics vs. hydroponics, but what is the difference between using a growing medium or no growing medium. Aeroponics is a finicky art. It requires maintaining a good pH balance, the right nutrients, and a lot of care. Growing plants using Aeroponics involves hanging the plants grown in net pots in a growing chamber with their roots exposed. There are microbes on the roots that digest the nutrients for the plant, making them easily accessible. The plants are sprayed with nutrients at the roots in intervals and given time to rest. The system uses the least water and nutrients because so little is wasted. Plants can be grown much closer together because there are no constraints from growing medium. Plants grow faster because they have what they need available immediately. System requires grower to be able to set up, maintain and repair pumps, misters, times and similar equipment. 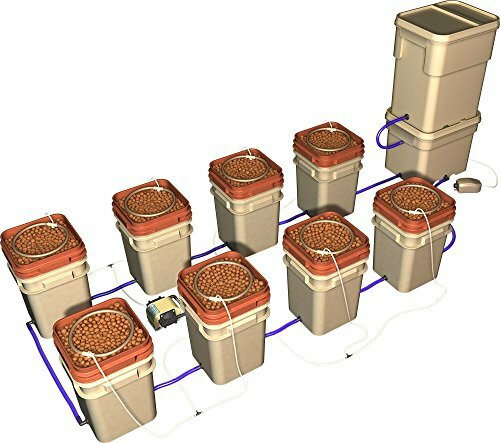 Aeroponics looks like a good choice for the professional grower because of the huge efficiency savings, but for personal growers or hobbyists. Aeroponics may involve more investment than they may be willing to spare. Ever considered gardening indoors with soil and hydroponics? Soil hydroponics is a hybrid system that brings the best of hydroponics, like growth gains and increased oxygen, together with the ease of using soil. It uses an air injection technology to increase plant growth and size. It allows you to use your own soil, grow organic if you want, and layer that over hydroponics material and an air pump. Soil: the dirt your grandma uses to grow cucumbers and tomatoes. So, why use hydroponics over soil? Let’s illustrate some pros and cons of soil vs hydroponics as well as soil hydroponics. Plants grow faster and larger. Uses less water and nutrients, more water efficient. Makes overwatering and root rot a non-issue. More expensive to set up than traditional soil. Requires a moderate amount of technical knowledge, but still workable for the part timer or hobbyist. Grandma can help if you run into problems. Takes more space, less plants per square meter. Can use your own soil and pots and still get fantastic growth and size that hydroponics offer. Slightly easier to set up than a true hydroponics system. May be slightly less expensive as more natural soil is used, which is very inexpensive. Can also use your own pots. Allows gardening indoors with soil and hydroponics. Need a few more technical skills than growing in soil. More expensive than soil alone. Hydroponic systems have been around for a while now. They’re constantly being innovated, and a variety of different systems exist for a whole host of purposes. Which system you should select really depends on the way you intend to grow. Water culture systems, ebb and flow systems, as well as wick and drip systems are all great systems, but they work differently. It’s probably the first system that pops into your head when someone mentions hydroponics. Essentially, your plants float on top of the water, which you will fill with the proper amounts of liquid nutrients for absorption. Most of the time, the plants are anchored to Styrofoam pieces that are situated on top of bubble stones, which provide different nutrients that need to be expelled with oxygen. It is similar to traditional water culture, but it’s a little more complex. They’re easy to modify on your own, or even create from scratch. In deep water culture, your plants are contained within mesh cups, where the roots are met by high powered, nourished oxygen. In deep water culture, you’ll need stones that will provide the maximum amount of oxygen to assure enough is reaching the roots. Creating a plentiful amount of oxygen is of the utmost importance to creating an effective deep water culture system. 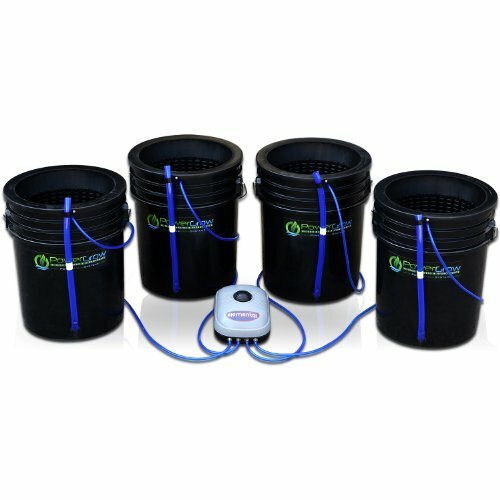 These systems are the most economical options, and are great for first time growers who are still determining what they require in a hydroponic system. The plants are situated in a large tray, where they are held together by cubes of rock wool. Throughout the day, the tray is flooded to release the necessary nutrients and water. As a start up, or for a temporary garden, you can’t go wrong with the simplicity and the price point of establishing an ebb and flow system. They’re similar to water culture systems, with the main difference being that your plants are actually suspended above the reservoir. The plants are drip fed, almost the same way that a coffee pot will brew coffee. Because of the nature of these systems, they require more maintenance, but they also offer you the maximum amount of control in the growing process. These systems are a unique method of oxygen delivery. The roots of your plants are provided oxygen by a special wick that carries the oxygen through two layers. Your plants, sitting in a shallow tray, are receiving oxygen from a deeper layer where high powered oxygen stones are located. The wick serves as a delivery method between the two layers, allowing the oxygen to pass efficiently, targeted directly to your root system. It all depends on the amount of space you’re growing in, and how much money you’re willing to sink into your initial investment. If you’re only dabbling with the idea, or you’re sure your project will only be a one time gig, you can’t beat the value you would get from an ebb and flow system. Water culture systems are the most effective, and will last the longest. You’ll only have to make the investment once, and you’ll be able to reuse them constantly. Because these systems are the most popular, you’ll find a larger variety of them, allowing you to pick and choose. Drip systems are great for experimentation. If you think you have an idea that defies the norms, a drip system will allow you to test your growing theory. Targeting specialized needs will be far easier than with other systems, as long as you have the time to maintain this more complicated setup. Wick systems provide you with the best oxygen control, but it’s not necessarily better than other oxygen systems. If you’re growing a variety of plants that have special oxygen needs, wicking is the way to go. Decide on a few things before you go and buy a system. Do you want Soil, soil hydroponics, a true hydroponics system or an Aeroponics system? Do you want to grow indoors or outdoors? Don’t forget to include water, fertilizer, nutrients, electricity, lights, soil or growing medium costs. Figure out what each system will cost up front AND in the future before you commit to a system. 1. Place the airstone at the end of the tubing and thread the tubing thru the top of the lid. The airstone should reach the bottom of the bucket. 2. Place the lid on the bucket. Attach the other end of the tubing to the air pump or bubbler. 3. Prepare Rockwool. Soak the wool in water with a pH of 5.5 for 2 hours. Pour the water out and add the nutrient solution, properly diluted for your plant. Remove cubes and place in tray. Place one seed in each cube and place in a propagator. Place under a T5 grow light for 18 to 24 hrs per day. Once they sprout they are ready to go into the system. 4. Place the prepared rock wool inside the netted cups or in the netting of the netted lid. Place the netted cups in the lid. Fill the bucket with hydroponic solution. 5.Turn on the pump and grow lights and get growing. The best hydroponic nutrients for your plant depend on what type of plant you are growing. There are 2 basic types of nutrients: Liquid and powder. Liquid is the most common for the home grower and it is easy to use. The powder form is used most often by commercial growers, as it is easy to store and less expensive. Liquid fertilizer designed for home use is tailored to specific plant types, e.g. strawberries, peppers, or cannabis. So, logically, you would choose a liquid nutrient tailored to the plants you are growing. The best hydroponic nutrients for cannabis depend on the stage in the plant life. There is a growth, or Veg state, and then a bloom or flower state. The best hydroponic nutrients for cannabis during the veg stage will be high nitrogen and potassium and medium in phosphorous. The best hydroponic nutrients during the bloom phase will have low nitrogen, medium phosphorous and high potassium. Virtually all plants are suitable for hydroponics, but not all are necessarily profitable. Using hydroponics entails an investment in time and money that would be wasted on plants that would grow just as well outside, or don’t give you much of a return for your effort. Tomatoes are relatively easy to grow outside, cheap at the market and easy to find organically grown. There is not much profit in tomatoes, should you decide to sell them. It’s not to say that tomatoes are a bad choice for you, it is your choice after all, but many may not find the investment in time and money worth it. Or they may just plant tomatoes outdoors, as it is easier and far less expensive. One fruit, or berry that is a good choice to grow hydroponically is strawberries. They grow exceptionally well and produce well hydroponically, and this is not always the case if you decide to plant them outdoors. Strawberries take up a lot of space and the yield from growing outside can be disappointing. In a hydroponic setup, they can grow in a tower, and produce well. Another crop that is grown hydroponically is cannabis. It grows very well hydroponically, and yields better buds in a controlled environment. Not to mention the security and privacy afforded by growing these plants inside. The best hydroponic system for cannabis is one that can be kept securely indoors. A good light source which is neither too dull nor bright, and ideally has full spectrum light PLUS Infrared and UV light, especially during flowering. The cannabis plant is comfortable in places where you are. If the temp is good for you, the plant should thrive too. But, during flowering the temp should be 5 to 10 degrees cooler, just don’t go below 65 or over 85 degrees. Plants need to breathe they don’t need a fan directed at them, but one or two small fans in the grow space should work. Light can get lost from dark walls or open spaces. Paint the walls pure white or use other reflective material around the plants to direct that light back to the plant and get bigger yields. These plants like a slightly humid environment. While cloning 70% to 80% humidity is ideal. In the veg state, use 40-70% humidity, and the flowering stage should be the lowest with no more than 40 to 50 %. Well, it basically has two meanings. First, growing weed using Hydroponic method. And second, weeds that are grown by the use of Hydroponic system. The two definitions are actually just the same. Well, for my interested and passionate weed lovers, perhaps you might be thinking that cannabis is actually hard to plant especially if you will be using Hydroponic method since of course Cannabis is a very special plant. But regardless of any sensitive stuff, growing weed hydroponically is simpler than what you think. In fact, it is just very similar to planting other kind of plants. What you want to do is just plant it the Hydroponic way, and no need for any kind of particular approaches. Though for the most part, the discrepancy here is most likely on how you treat and provide care for your weed that will make the difference from other plants that are grown hydroponically. What you actually want to do here is sustain your Cannabis (that is grown hydroponically) with sufficient and correct amount of vital nutrients and minerals that will hopefully generate a bountiful yields. But then again, some of my fellow newbie growers are persistently asking me this due to their impatience. Well, how do I blame them? I want to show respect since they are my colleagues. For all we know, any plant that is grown in an already calibrated solution of mixed nutrients and minerals solution will give pretty much of a very fast growth and ultimately a very rewarding quality yields. Though without beating around the bush let me specifically tell you how long does it take for a weed to grow hydroponically. Yes, you heard that sound and clear. If you want to grow weeds hydroponically you plant them in their seedling form, otherwise it is really hard to grow them from seeds if you just splash them in a hydroponic solution. First things first, you must germinate your Cannabis seeds in order for them to become seedlings and generate a number of internodes and cuttings, and of course its rooting system must be very well noticeable. Then with that you can begin your growing stage. From here on, you now have about 9 weeks in order for your weeds to be fully grown. The entire hydroponic system must be set up and operating for about full day. All of the above mentioned stuff must be maintained during that time, particularly on the water temperature. If you are being bothered by keeping the water temperature, you can use a fish tank heater to increase its temperature accordingly. For water that is a little ward, just add more H2O, though just remember that the pump will also be generating heat, and so be very careful. Be sure that you always monitor the humidity and temperature of your growing area. Since this is the 1st week of the vegetative stage of your plant, it is crucial to take note that plants utilize an enormous amount of nitrogen. That’s why, be sure that your fertilizer contains a lot of nitrogen. Always make sure that the roots are also in good condition since this is the very “root” of effective development of a plant. Take note that, after the first week, the length of the root system must be the same as the plant’s height. Brown roots could indicate rotting of roots, or most likely the water in your hydroponic system is dirty. Of course, your plants will be certainly small while at this stage and week of its development, and will be adjusting to the amount of light. And due to that, you might want to use MH bulbs instead of a HPS lights because MH lights generate more effective type of light for quality growth. And lastly, what you want to do is keep the humidity intensity by spraying your plants with some kind of aerosol pretty much every day. During this phase, you must ensure that all the bulbs are on, and the distance from your plants must be around 20 inches. In relation to that, make sure that the temperature is not too high. If your temperature increases above 85 degrees Fahrenheit, your plants could induce significant burns. Within this week, you must get an exhaust fan and direct it to your plants. For instance, if they are consistently being blown by your fan, then most likely they will grow stronger stems due to adaptation which will ultimately lead to a better overall quality of your plant. The moment you begin seeing the leaf tips of your weeds touching the bottom of your hydroponic system, then it is most likely the start of flowering stage. If you happen to have a lot of plants under a single grow light, you might want to start the flowering stage as soon as possible to avoid clamping of the leafs of your plants beneath a single lamp. If you happen to lower the light time of your plants from around 18 hrs to just around 12 hrs a day, then you are ultimately tricking your weeds into thinking that the autumn is near. Basically, it senses that it must enter the flowering stage soon. It could take a little while of this constant schedule transition before you really see that your plant is actually changing. Always keep in your mind that you must feed your plant an enormous amount of nitrogen because it is still undergoing a lot of development. But right after 3 weeks of development, you can then focus on feeding your weeds on phosphorus since that particular element is used in generating flowers. Try to focus your fan just between your grow light bulbs with your weeds, permitting the heat to be spread throughout the growing area than being concentrated on a main point. In addition you must filter out the system with fresh water if ever you are changing up your plants’ nutrient cycle. Don’t ever neglect monitoring your plants, because their leaves might be starting to get discoloration, or any signs of harmful conditions. And of course, always embed it into your mind that the roots are the primary priority equivalent to your weeds’ leaves. At this point, you must halt any act of topping, though you may still continue on eradicating the some shoots of your plant that it doesn’t really need. If you do this, it will permit it to utilize its absorbed nutrients primarily for bud generation. Also, during this phase, expect your weeds to be growing quite fast. In other words you must be constantly measuring the distance between your grow light and your weed in order to ensure that it doesn’t shrink too much. Remember that weeds that get too long might be super cropped. That basically involves squeezing the stem and bending it with the utmost care of your weeds to promote strengthening of your plants overall physical being. At this stage, you will be seeing your weed’s first flowers showing up and the growth of your plant getting slow down at a particular amount. Your weeds will most likely be taking in tons of water at this phase, so be sure that you are sustaining them with sufficing amount of H2O. Also, at this point, you must have already eradicated any male weeds so they will not fertilize your female plants. Ensure your leaves not to be discolored, and the root system must be white and not off. Clean the water by flushing it at the end of every week, and be sure that you provide it a day or two before giving it some nourishment again. This will make your plant to utilize all of its remaining nutrients. At this very stage, you must be observing lots of buds sprouting everywhere, and of course some smell must be coming off of your weeds as well. This is a good indication that you must change your fertilizer so that your weeds will get more phosphorus rather than nitrogen. Most likely your weeds will not grow upwards anymore, but of course they will be growing buds consistently. At this moment, you can safely super crop your weeds. Make sure that you are keeping an eye on the distance between your grow light and the tops of your weeds. Your cannabis plants must be needing lots of light, so be sure that you are giving them enough without burning them. If you ever feel like getting uncomfortable when you’re hands are beneath your grow light, then what more of your weeds. CO2, H2O, and all kinds of vital nourishments will most likely get devoured by your weeds at this week of your plants’ growth process at a very fast rate. Make sure you are utilizing your fans really well during this stage, and of course your water supply must be always ready at any given moment. You want to be shocked? If you didn’t know, at some instances, during this phase of your weeds they are often consuming as much as a gallon of H2O! Make sure that you are maintaining the environment at a good condition during this week, even if it’s quite a hassle. Also, at this week, you must ensure that the pH level of your solution must just be around 5.8, and don’t trouble adding any unnecessary nutrients during this time just to balanced your solution’s pH level. During this week, you can observe significant buds development, which is why you will really need a great amount of potassium than any other kind of nutrients. And in fact, you will be able now to perceive the THC fragment of your cannabis plants – it is the white layer on your weed’s leaves that surrounds the buds. A good indication that your plants are super healthy is if you see a great amount of white layer around your buds. If ever its color starts to turn orange, then fret not, it just means that harvesting it is near. Of course your buds are still getting developed at this phase, but more likely it is because your buds are now focusing on producing THC and becoming more abundant. If you start to observe that the leaves at the bottom of your weeds are starting to turn yellow, then don’t worry since it’s just normal. Though what you want to think of is if there are mold’s getting formed and any leaf discoloration. If you happen to observe anything that seems like mold at a certain part of your weeds, get rid of it immediately by chopping that part of. The most significant thing that you must do here is to make sure you are only giving water at this phase so that you could taste your weeds even better after harvesting it. Be patient until some little hairs are at 90% brown prior to harvesting your cannabis plants. At this point, you can choose whether to harvest it on your own free will. Or if you are quite skeptical you can base your decision at some genuine information. Now, that sums it up! But of course you can’t start growing weeds hydroponically without any kind of hydroponic system. That’s why; let’s now proceed on my Top 10 Best Hydroponic Systems out there. This hydroponic system just completely exceeded my utmost expectations. It came with everything it listed. Its pump works great and it doesn’t produce loud noises. The air stones are of good size. Its medium is very good! It will grow one cannabis plant. Includes the bucket, lid, air pump, tubing, air stone, growing medium and seed starting plugs, water level indicator, drain and of course instructions. 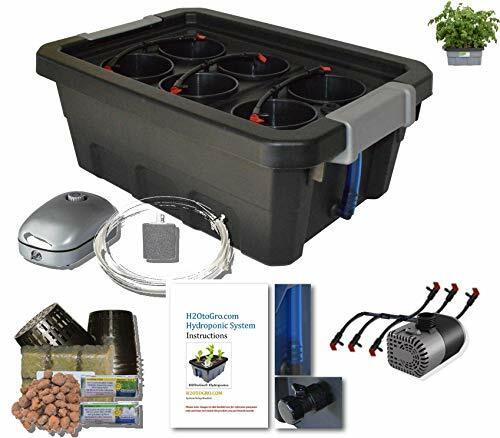 In addition, this easy to use kit is very great for the gardener that is just getting started with hydroponics, since it is an inexpensive kit that has just about that all you need. One of the best cheap hydroponic systems that don’t sacrifice quality and also perhaps the best indoor hydroponic grow system for newbies. In addition, this product could perhaps answer the question on what is the best hydroponic system for cannabis out there. Overall, this product is just really worth my bucks. You only need to provide the light source, the seedlings, and choose a nutrient mix that suits to your plant. It is a great introduction to Deep Water culture hydroponics, an easy step to take and perhaps one of the best hydroponic systems for cannabis. Incredible little setup if you only need an affordable yet reliable bubbler they hook it up great air stone, net pot with lid is really good. These are much easier to deal with and I feel like I can get the same if not close to similar outcomes. This 3.5 gallon kit has everything you need for one medium size cannabis plant. 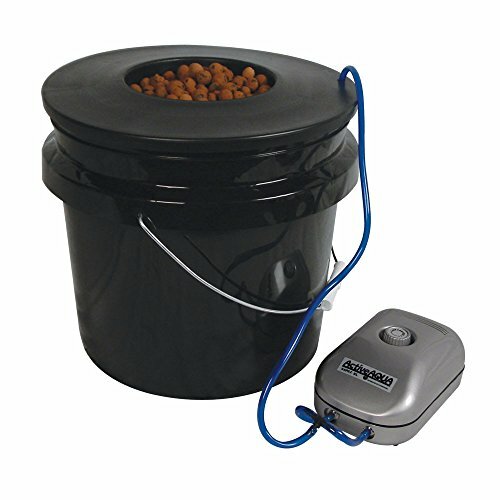 In addition, it also includes a bucket, lid, pump, tubing, hydro stone clay pellet grow medium, and instructions. This compact system makes getting into hydroponics easy, without getting in over your head. This product is really nice. It is packed well and comes with grow stone medium that I didn’t really expect. This is a nice set if you aren’t feeling putting all the pieces altogether yourself, and pay similar amount or more to pieces to set together yourself. 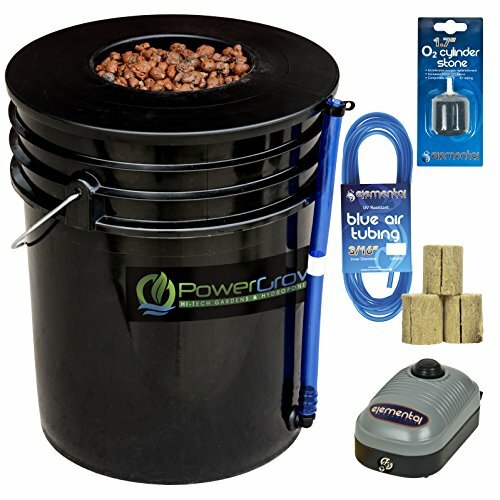 One of the best hydro system for weed. Overall, nice buckets and nets, the pump has been operating perfectly. In addition, it comes with big aerator stones, and quality tubing. Great all-inclusive kit for both beginners and advanced growers who want to increase their yields. This item is incredibly good for newbies out there. It is very suited for individuals who don’t have enough time, money, and tools to make their own Hydroponic system. One of the best hydroponic system for weed because of its bubbler. Apparently, this one is a great set-up. Its buckets are great and work really well. 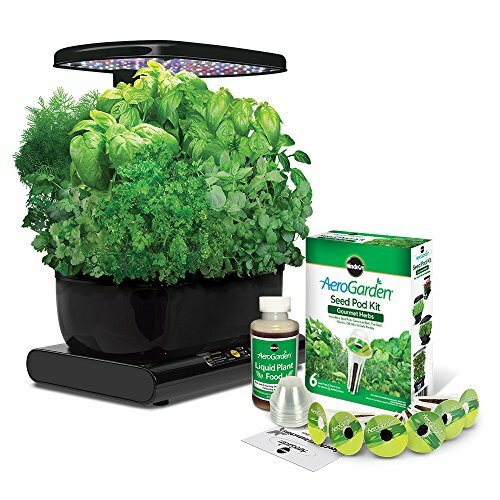 Overall, this hydroponic system comes with pretty much everything you need except for the seeds, light and nutrients. An easy and inexpensive way to upgrade and produce more than one plant at a time. In addition, this product is one of the best hydroponic systems for cannabis in my opinion. This one’s setup is just excellent. This is a great hydroponics for newbies or experts to the wonderful world of hydroponic growing. This is just a quick and easy way to get into hydroponics. Just get some rock wool cubes and your seeds of your choice and you are good to go. In addition, it is also a very good package deal as far as price is tackled. I thought that its air pump would be loud, and a little cheap, but it is not compared to my other systems. One of the most efficient hydroponic system out there. Overall, it is pretty cool, and I had a very great experience and fun using this hydroponic system! A truly complete one plant system that includes ample high quality hydroton rocks and plant nutrients. This system stands out very much since it is very inexpensive. In spite of its very cheap price it comes with lots of features such as a self-watering system, water level indicator, and a bubbler system for optimal oxygenation. In addition, it is very easy to utilize and can be easily used by beginners. Its self-watering system utilizes drippers to deliver nutrient-rich H2O to your weeds in just the right amount, so all of them can reach at the right time for effective and efficient development. Its bubbler works together to get your weeds exactly on what they need to develop to their full growth. This product is super inexpensive and an amazing choice for newbies. 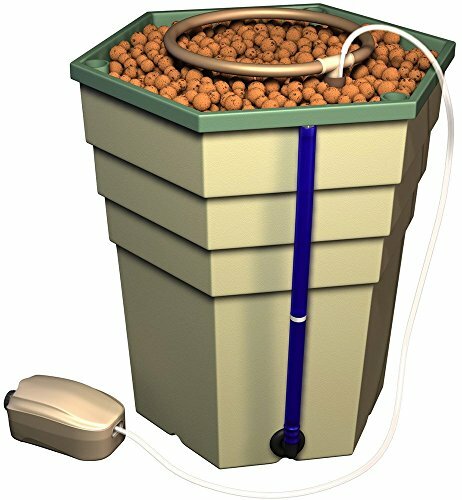 Perhaps this is one of the easiest to use among hydroponic systems out there since it automatically takes care of flooding and drainage. In addition, it comes with nutrients, PH test kit and start cubes, so you can start growing from your first day. It also permits you to grow your plants 5 times faster than soil. You must also take note that it comes with a fired-clay and pebble grow medium so you can get even better results. It also has 15 pods on where you can grow your favorite flowers, vegetables and herbs. It would most likely fit in any grow area in your house and it doesn’t really matter if you don’t have much space available since this system will fit pretty much any space. All in all, it includes everything that a newbie grower needs with a very low price. This one is an incredible system. It is very ideal for urban growers! 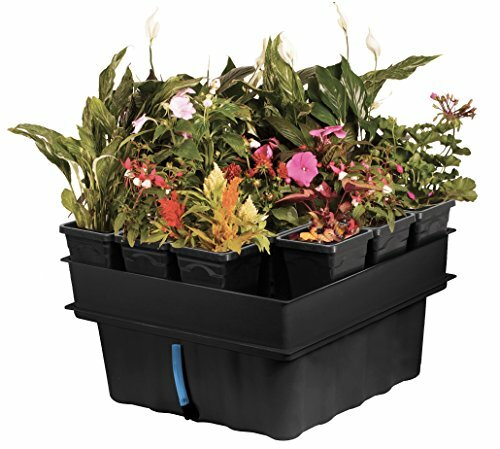 This product is great for growing herbs, vegetables and flowers. Its maximum design permits you to place it anywhere in your home since it doesn’t really occupy much space needed. It will bring you very fast and powerful results. For the price, it is more than sufficient particularly when you consider that it comes with similar Gourmet Seed kit. Overall, it is an amazing choice for the price, particularly if you are just a newbie who only wants to give this kind of gardening a try. Thanks to this choice, you will discover wonders of cultivating plants in a solution instead of a soil. The 20W LED grow lighting system is good, but should be improved. If you are seeking for something affordable than the Miracle-Gro AeroGraden Ultra, then you have this version which offers you various interesting features at an amazing price. The most prominent factor of this item is that it comes with two combined systems. Those are DWC and Nutrient Film Technique. Meaning you get the best results from both methods! The features from the NFT system give your plants the nutrients crucial for growth, while the features from DWC system give your plants a quick growth. It comes with a 13-gallon reservoir and 8-gallon controller unit, which is very convenient and worthy. Each bucket could possess up to 5 gallons. And what more, regardless of its large size, it can fit in almost any grow tent. Perhaps one of the best hydroponics setup. Overall, if you are seeking for the most efficient hydroponic growing system, then you must check this product since it comes with all the features necessary to grow any plants. Gives you 8 buckets and can be upgraded up to 12. It doesn’t come with pollinators. If you are taking indoor gardening seriously, then this product is the most ideal you will ever find! 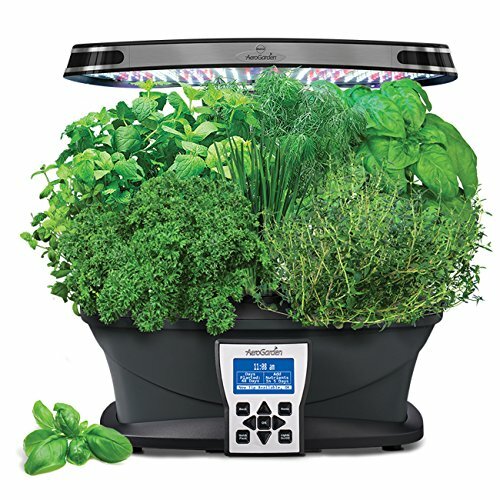 It is a great choice since it comes with a powerful LED system that brings your plants a vast range of light spectrum so they could get the best from UV and IR lights. In addition, it is very easy to utilize, that’s why it is an ideal choice for beginners. This product is very good for growing vegetables, herbs, and flowers. And of course, it comes with a very worthy and interesting additional stuff, a 7-pod Gourmet Herb Seed kid. 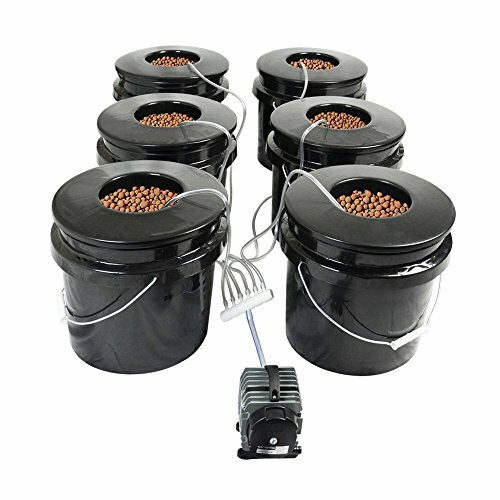 Best indoor hydroponic grow system for me. Best Hydroponic system for me! Best Hydroponic system for lettuce and best hydroponic system for peppers in my opinion. I mustn’t forget that I’ve also once used this on growing some strawberries and therefore one of the best hydroponic system for strawberries for me as well. With that, it is obviously an excellent product. If you are a newbie and want to get a system that will permit you to grow healthy, vibrant, and tasty plants, then get this in your hands. This product is one of the best choices for most indoor growers since it has a very affordable price that comes with excellent yields. Now that I’ve shared to you my Top 10 favorite hydroponic systems, you might want to start having some fun now and answer your question of what is the best hydroponic system out there. Because I tell you this, I’ve got loads of enjoyable moments using these 10 throughout my growing career. They just gave me so much satisfaction because of their performance, bliss if I must say, particularly the last hydroponic system in my list. I enjoyed it because of its included 7-pod seeds that’s why it is the best indoor hydroponic system for me. You want to know the feeling? Go choose one of my top 10 hydroponic systems and I assure you, you’ll most likely get a liking to growing plants hydroponically because I am simply telling you the truth.